I’m just going to update a few seasonal posts that were late. Sorry about the delay, hopefully you can still make use of the ideas. 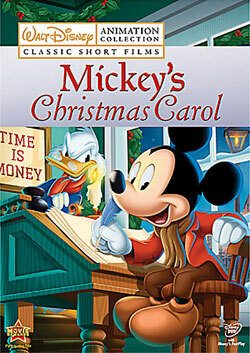 For our final Christmas movie night we did Mickey’s Christmas Carol. I looked everywhere for a goose but I couldn’t find anything under $50. Since my husband wasn’t keen on trying it for our actual Christmas dinner, I decided to do the “before” version of the Cratchit’s dinner. More our style anyway. 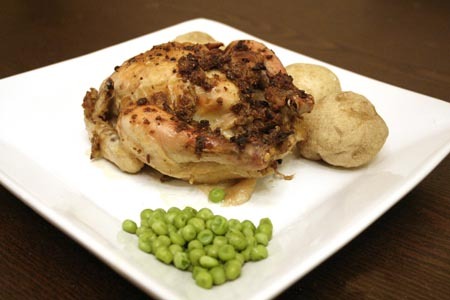 So I went out and got a cornish game hen and we did it with a glorious new stuffing recipe based on one found here. I’ve put the recipe with the changes I made below (I removed the walnuts and olives changed the raisins to cranberries and made it vegetarian). I guess that turkeys in the store are getting larger and larger and portion sizes are increasing all the time but because I am a vegetarian, the hen only had to serve 3 people and it was the perfect size! I will buy them more often after this, just for a surprisingly easy dinner. 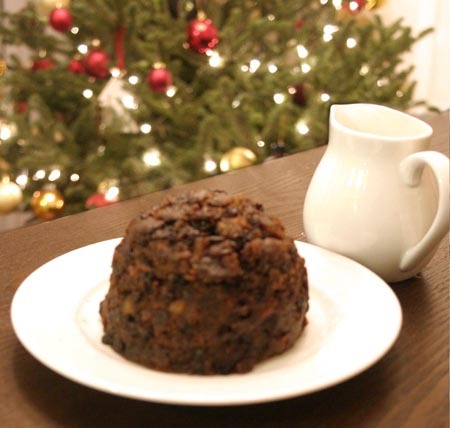 We had plum pudding with sauce for dessert (it was a favourite of my mum’s) and I was thrilled that the kids actually liked it! I used a store bought pudding and found the recipe for the sauce here but I’ve posted it below with the changes I made (we just removed the brandy for the kids). 1. Heat a large sauté pan on medium heat. Melt 45 mL butter in the pan, add the bread cubes, and stir to coat the bread pieces with the melted butter. Then let them toast; only turn them when they have become a little browned on a side. Note, if you aren’t working with somewhat dried-out day-old bread, lay the cubes of bread in a baking pan and put them in a hot oven for 10 minutes to dry them out first, before toasting them in butter on the stove top. The bread should be a little dry to begin with, or you’ll end up with mushy stuffing. 2. Sauté chopped onions and celery on medium with the remaining 45 mL butter until cooked through, about 5-10 minutes. Add the bread. Add chopped apple, cranberries, and parsley. Add 250 mL of soup veggie soup base stock (enough to keep the stuffing moist while you are cooking it). Add poultry seasoning, and salt & pepper to taste. 3. Cover. Turn heat to low. Cook for an hour or until the apples are cooked through. Check every ten minutes or so and add water or stock as needed while cooking to keep the stuffing moist and keep it from sticking to the bottom of the pan. Yield: Serves 8-10 (lots of yummy leftovers). 1. Combine ingredients and cook, stirring constantly until the sauce thickens. For the craft, I told the kids that we would take the money that we usually spent on the craft and put it towards the charity of their choice. We talked about all the different sorts of things they could donate their money to. My daughter decided quickly, and gave money towards a well in Africa with World Vision. My son had more trouble. He thought and thought but he couldn’t decide. And here is where it gets funny. He had been asking about Grand-Santa from Arthur Christmas and how he spits out his teeth when he eats his mince tart. He was horrified that he could actually do that and I told him a lot of older people have dentures they can remove. So out of the blue, all of a sudden, he says, “I want to give my money to people with no teeth!” So we did. Hope you all had a wonderful holiday with a lovely Christmas and a Happy New Year! God Bless Us, Everyone.